Just a quick warning. A neighbour's son had his bike taken from him on Friday afternoon on the 'alleyway' past Sunningdale Rd after school ( he was with a friend). Brief description is of a coloured youth approx. 18 - 20 years old with hoodie and bandana (must be colder than we thought in Flixton). It is thought the gang originate from Old Trafford and are moving out our way, unfortunately they have not been caught in the act as yet. Tell your children to be careful and be wary of taking shortcuts. If your bike has been stolen, look here to see if your bike appears for sale on the internet. "The occupier owes a duty of care to all lawful visitors"
Just as well really, I care far less about my legal obligations than I do about the safety of my family. If I remember correctly the law is one of occupiers liability. As the owner of the property you have to ensure that you take reasonable care to ensure that visitors to your property do not get injured - which also includes uninvited visitors. I think you have to have a notice up like beware dog, I have one at my front door and one on my back gate, then if your dog bites anybody on your premises they cant complain because they have been forewarned with the notice. (If its dark and they can't read the sign TUFF they should not be there anyway, I hope they dont come snooping again but if they do I hope your dog rips them to bits, that will teach them a lesson). Sadly the Police do not want to know where Bikes are concerned - we found one a few weeks back in the Flixton area - obviously stolen and dumped - on phoning the police I was told to hang onto the bike and if it's not claimed in four weeks it's mine - they would not even come and collect the bike and it was in really good nick. Mandy - love the idea of the dog seeing them off! Shame it didn't bite them!!! On Friday night, at around midnight, people were in our back garden. Once again they tried to steal 2 bikes which were chained up next to the house. They came over the fence between us and our neighbour, so had probably been prowling round a few of the gardens on the road. Fortunately our dog heard them and began to bark. We let her out of the back door and she gave chase. She must have given them the fright of their lives and they knocked the bins over in their hurry to escape. Unfortunately they escaped over the fence again before the dog got to them. I wonder if there would have been any come back if the dog had bitten one of them? I am Mike's daughter. My friend's dad has had his bike stole from his garden shed. Me and my friend did a little investigation. We found that because they had their bins up against the fence they must of climbed up from there. They also must have had a pair of bolt cutters as the bolt had been cut. Then got down and cut the shed bolt. They had also tipped everything else out onto the floor. Got out the bike and made a run for it. They had also broke in the week before that and took a scooter. This happened in the middle of the night. So I would just watch and if you have a dog I would prepare him to be on patrol. LC I saw a bike like that in the bushes near the motorway footbridge at the Trafford Centre the other day I called the police to collect it but as I was on my way home after a night shift I didn't stay to see if they picked it up. Found the old rusty bmx on Gloucester Road today, obviously the scroats could not ride it to far without air in the tyres derrr!!! 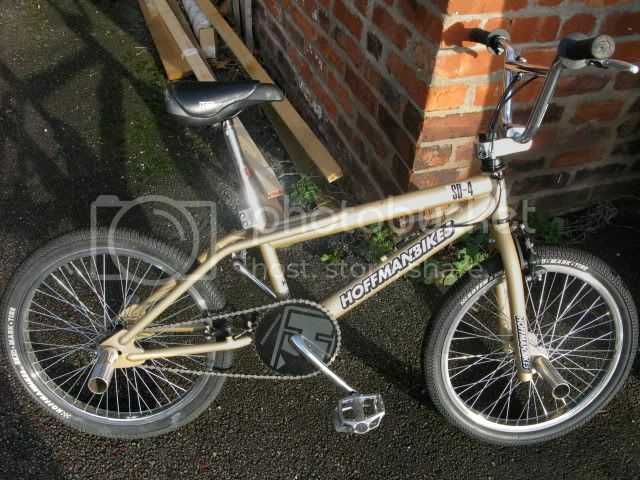 Some scumbag entered our garden in the night and have stolen two bikes one is a quite old rusty bmx (with popped tyres) and a blue Shogun mountain bike with disc brakes in excellent condition, if you see these bikes around please leave a message on here, we live close the the total garage just off Stretford Rd in Urmston. This has been an ongoing problem in this area for quite some time now. Seems there has been another bike theft early evening today, in the same place, same description of thief etc, of a red mountain bike belonging to a paperboy. Anybody know more about it? I don't condone labelling anyone with a derogatory term either nationality or colour or anything else. The point I am making is that the pc brigade seem to go out of their way to make problems and here is an example. If a person gets arrested and charged they have to answer questions to the police and if it is a white person they can describe themselves as a black person, or the other way round if they wish and the police have to enter that on the report. How silly is that. Steak, I'm definitely not a member of the PC brigade but it's fairly obvious from recent history that the word in question carries all sorts of connotations, has become outdated and is the reason the thread veered off topic in the first place. As someone has mentioned it may be a generation thing because as soon as I saw that word it made me cringe. There are numerous other threads on this forum about anti-social behaviour but I don't recall the word 'white' being used as part of any description - that's my main point. Is there any update on the original bike issue? What about sticks and stones and all that, even if certain words are used as insults it shouldn't be a problem. I get called a few things and I also call people a few choice things now and then, some justified, some not, but at the end of the day nobody died or got hurt its just one of them things, the people who try to make an issue out of such goings on are no more rational than the people who smash phone boxes up. I don't think the so-called pc brigade were responsible for identifying the word coloured as offensive (when used to describe black people); I think it was black people themselves. It worries me when a mythical cabal of white liberals is identified as being responsible for advances in the rights and treatment of women, gays, people from ethnic minorities, etc., when history shows that all of these people achieved these things themselves. It seems to let off the hook anybody who attacks these values. An interesting question: will any of those people who previously used the word "coloured" stop doing so, now that it has been identified as, at best, impolite? You are obviously of the pc brigade. It never was designed as an insult also it was never taken as an insult. The pc brigade have made it that way along with lots of other things and I think it is a pity they have not got more important things to think about other than changing things round just to create problems. Michelle, if a comment is offensive the itent of the person making it is irrelevant. It is the perception of any recipient (note: not necessarily the one to whom the comment was made) that will dictate whether or not offence has been caused. Obviously, a non PC word would have to be used - we all know what they are so no need to expand here. As far as use of "coloured" goes, it's my understanding that it is more insulting than offensive. By that, I mean that it not deemed to be a derrogatory term but it's use is not polite. Having said all that, it's still barmy - the lot of it. You know when somebody's having a go and when somebody innocently says something. People should be mature enough to distinguish between the two but alas, with our thriving compensation culture, common sense has become a sorely missed thing of the past. OK we'll let off Granny but I can't see how you can brush aside a 5 year old referring to a friend as 'coloured'. At the very least I'd expect you to explain to the child why this term shouldn't be used. I'd also be interested to learn where they picked it up from. It would be interesting to see the reaction when you're child uses this term in a crowded place. You're forgetting that ignorance is no excuse, even if something in not intended as an insult. Dame Edna Everidge once described someone as being "A tinted person". And a few years back, a friend said to me of the Mardi Gras Festival in Manchester: "You don't have to be gay to attend; it's okay if you're just happy." Anyway, did this poor kid get his bike back? Oops! I said "kid". That's a baby goat. Oh dear, here we go again! Michelle. Well said. I totally agree. You're right to bring the topic back (and Political Correctness probably deserves its own topic). Totally agree with you, if there is any backlash just ignore it. Sorry to bring this topic to the forefront again - however the development on it has really annoyed me. Surely a "racist comment" only becomes racist in the manner that it is used i.e. in a derogatory manner i.e. specifically meant to offend. If your 90 year old granny made mention of her "coloured" doctor, or your 5 year old child referred to his "coloured" friend would people suddenly then get all heavy with them calling them racist - well lets hope not. To be honest I use the term "coloured" I have never used it in a manner in which to offend I have simply used it to refer to a particular person - I am certainly not a racist & never will be, and I would take serious offence to anybody who every suggested that I was. The term that Mike used, was one that was acceptable until the PC brigade believed that it wasn't - I am now awaiting the backlash for "inappropriate comments". Dave, it is a generation issue but it's not just a generation issue. There is a huge problem with communication as well. We only ever hear of people being offended by the use of a phrase or term, never that it's use it to become derogatory. And beyond that, is the use of a certain word which was once widely used, became highly offensive and is now used by those who were directly offended by it, as a status symbol. (Obviously, I can't use it as Dave would have a problem authorising the post but suffice to say that if misspelt, you would have an African country). How is anyone meant to know what is and isn't acceptable? I think it is a generation issue. When I was a kid it was definitely the policy to term black people as being "Coloured", and I'm not that old. Calling someone "Black" was, at the time, considered offencive. I authorise all the threads on the forum and I didn't have a problem with the term but I am aware too that it is okay to say that someone is black. I agree with Tom here. When I read the initial post, I remember thinking to myself it was an old fashioned term to use, but nothing more. Then reading through, somebody says you can't say 'mixed race'. And I always thought that was the acceptable term, not so it seems. So there you go, I learned something today. What struck me most though was that there was no description of the bike stolen. That would have been handy because although we all think it's now gone to a new home in Old Trafford, that maybe untrue. There have been a few bikes taken near me, not far from this incident. And then the 'borrowers' are trying to sell them locally, one even having the nerve to call at my house to see if my son wanted one. So let's have it's description then, forget the off-topic diversion awhile, and see if any of the locals have seen it appear recently. We should fight the crime not each other. A child has had his bicycle stolen. Do you really think this child cares about how the report was worded? I don't think so. He just wants his bike back. As Tom said "Nothing in this thread is derogatory. You're splitting hairs." I have several "coloured" friends and none of them have any issues with that word. One even went out of his way to blast the PC brigade for looking for racism where it doesn't exist. As he said "They don't speak for me." Take your agenda elsewhere and lets focus on the real issue here.